Dom Cobb (Leonardo DiCaprio) is a professional thief who uses high-technology devices to invade other people's dreams and steal their secrets. 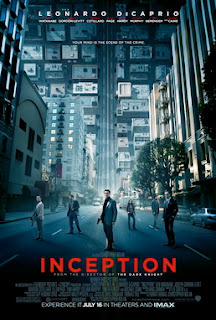 After an extraction attempt goes wrong, he is reluctantly forced into taking a contract to attempt an 'inception': not stealing information from another person's dreams, but implanting an idea instead. Cobb's own traumatic past, however, threatens the mission when his own demons follow the team down into the dream world. Inception was the zeitgeist film of 2010, attracting not only critical acclaim and box office returns but also widespread discussion, parody and satire of its themes and content, and a lot of subsequent films riffing off Hans Zimmer's exceptional orchestral score. It is an exemplary case of taking one imaginative core concept, and then playing it out in ways that push the visuals and the story in interesting and arresting directions. At the time industry pundits were predicting a subsequent golden age of smart American blockbusters. To date that age has not entirely eventuated - even director Christopher Nolan has failed to match it with his two later films The Dark Knight Rises and Interstellar - but even if it never does, Nolan has left behind a remarkable and memorable visual masterpiece. This is one great film. One of the key elements that makes the film work so well is the manner in which film narrative - particularly the use of 'in media res' openings and film editing - so accurately reflects dream narratives. When Cobb explains how dreams work he is simultaneously explaining the same of narrative cinema. It makes sense to us in the moment, but if we were to break it down and examine it closely we'd find an enormous pile of holes. We might see a character wake up in bed, and then cut to them sitting at their desk at work, but we do not question how they got dressed, or whether they ate breakfast, or how they took public transport to the office. Motion pictures have trained us to accept the reality that any given film presents to us. This creates an intriguing effect in Inception, since as the dream sequences are so deliberately filmic we begin to also distrust the 'real world' scenes at the same time. Is Cobb dreaming for the entire film? Nolan raises the question, but deliberately does not answer it. This is the smart move on his part, since the ambiguity is what makes the film so entertaining and not some mystery to actually be answered by the viewer. The use of dream imagery also allows Nolan the luxury of indulging in outstanding flights of fancy, including a pastiche of On Her Majesty's Secret Service, trains smashing their way through a busy highway, immense fractured cities collapsing into the ocean, Escher-like architecture, and a superbly realised action sequence set in a hotel corridor where the gravity keeps coming, going, and moving from floor to wall to ceiling. Any other film would struggle to unite all of these disparate elements, but by setting them all inside dreams Nolan gets away with anything he fancies. The cast is strong. DiCaprio is almost always exceptional, and here he's supported by an outstanding ensemble including Ellen Page, Michael Caine, Tom Hardy, Ken Watanabe and Joseph Gordon Levitt. It's Levitt who impresses the most, finally shaking off his image from earlier teenage roles and establishing himself as a tremendously engaging and charismatic leading man. He really should be a much more popular actor than he is. Hans Zimmer provides a wonderfully atmospheric musical score - easily one of his best - and he embellishes and enhances it with elements from Edith Piaf's "Non, Je Ne Regrette Rien" in tremendously inventive ways. I am always particularly struck by the Morricone-esque guitar riff that plays through some scenes, played in the score by ex-Smiths guitarist Johnny Marr. Inception is simply a perfect confluence of talented contributors. It boasts a smart concept, a dense structure, a simple hook, beautiful visuals, strong performances and a memorable musical score. For Hollywood it was the best film of its year. For Nolan it represents one of several high-water marks in a tremendously successful career. It does not quite beat my personal favourite among his works - The Prestige - but it comes mightily close. This was the 1,900th post on The Angriest. Thank you for reading.